Yesterday we looked at the isolation of the US and Canada in keeping the Boeing 737 Max aircraft in the air. Later that day, both countries grounded those aircraft. Today in the print edition of the New York Times the front page used significant space to chart the vertical speed of the two crashed aircraft. 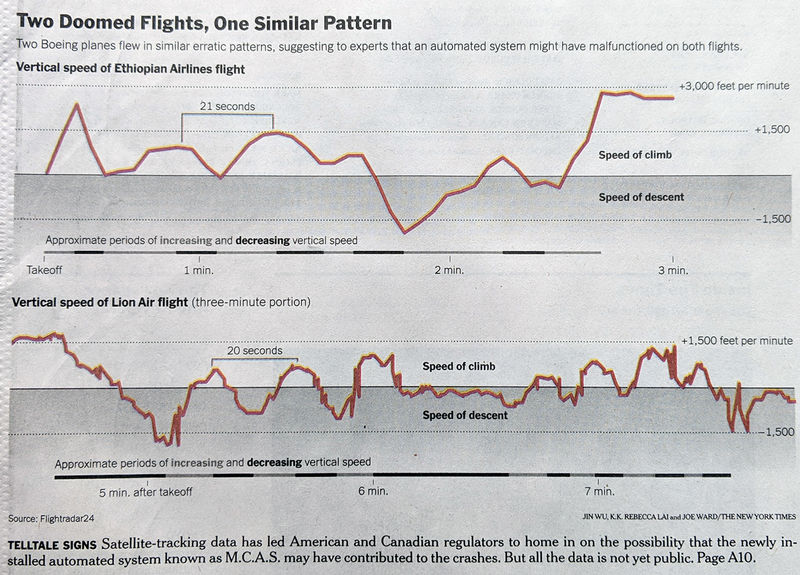 It uses the same scale on the y-axis and clearly shows how the aircraft gaining and losing vertical speeds. I am not sure what is gained by the shading below the 0 baseline. I do really enjoy the method of using a chart below the airspeeds to show the periods of increasing and decreasing vertical speed. Credit for the piece Jin Wu, K.K. Rebecca Lai, and Joe Ward. On Sunday, a Boeing 737 Max 8 aircraft crashed shortly after taking off from the airport in Addis Ababa, Ethiopia. This was the second crash in less than a year, since the another 737 Max 8 crashed into the sea shortly after taking off from Jakarta, Indonesia. And in the intervening months, there have been numerous reports to American regulators from pilots of problems with aircraft in flight. Unsurprisingly, international regulators have begun to take steps to protect their skies and their passengers from what might be an unsafe aircraft. American regulators, the Federal Aviation Administration, remains unconvinced. Consequently, the New York Times put together a graphics-driven article that details just how extensive the global grounding of 737 Max 8 aircraft has been in the last 24 hours. There’s a lot more orange than blue. It’s a route map to headline the article. And it shows that almost all aircraft on 737 Max 8 routes, except for those in Canada and the United States, have been grounded. The rest of the article makes use of more maps highlighting the countries who civil aviation authorities have grounded flights and popular routes. It also includes a bar chart showing how many 737 Max 8 aircraft are in use with each airline and how many of those airlines have had their fleets grounded. 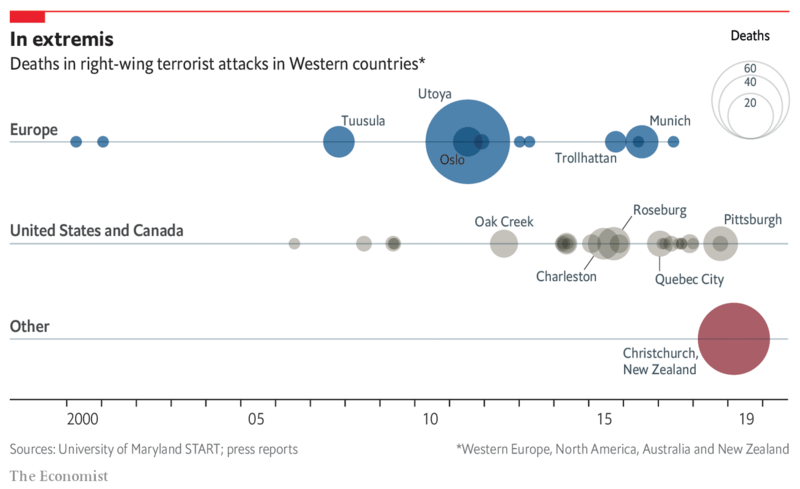 Overall, it’s a strong article that makes great use of graphics to illustrate its point about the magnitude of the grounding and the isolation of the United States and Canada. Credit for the piece goes to Denise Lu, Allison McCann, Jin Wu, and K.K. Rebecca Lai. Happy Friday, everybody. We made it to the end of the week. And so now we have xkcd going all back to school and teaching us all simple statistics. And if they ask for the mode, you serve the chart with ice cream. For those unfamiliar with statistics, that’s not at all how it works. This Washington Post piece caught my eye earlier this week. 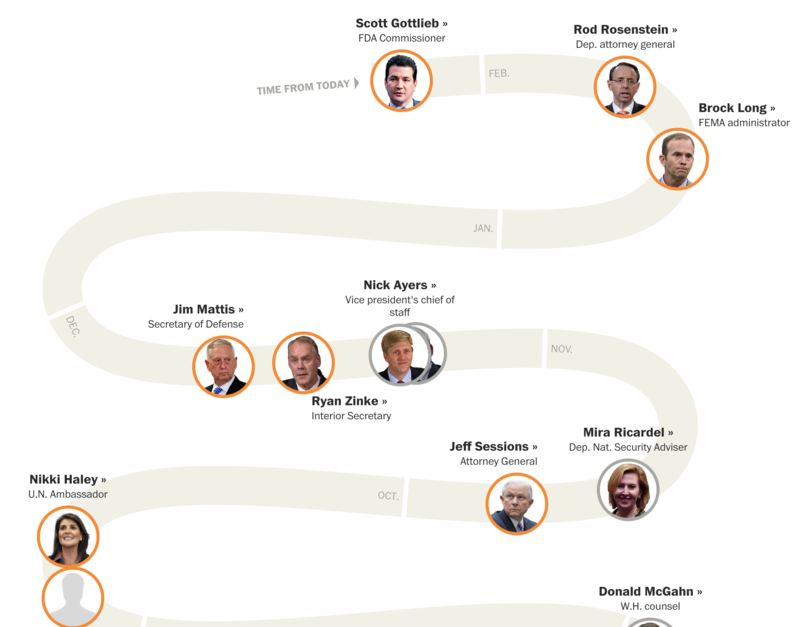 It takes a look back at all the departures from the Trump administration, which has been beset by one of the highest turnover rates of all time. What I like about the piece is how it classifies personnel by whether or not they require Senate confirmation. For example, Ryan Zinke as Interior Secretary had to be approved by the Senate. Nick Ayers, Pence’s former chief of staff, did not. Importantly each name serves as a link to the story about the person’s departure. It serves as a nice way of leading the user to additional content while keeping them inside the graphic. The further down the piece you go, there are notable sections where blocks of body copy appear in the centre of the page. These provide much more context to the comings and goings around that part of the timeline. Admittedly, I only read today’s piece because of the photograph on the Washington Post’s homepage. It featured a giant banner saying Lordstown (Ohio) was the home of the (Chevy) Cruze. Every single time I drove between Philadelphia and Chicago I would see that sign. It was also near the halfway point, so whichever way I was headed I only had about six or so hours to go. But the article itself is about the trials of people working in the area where that plant is located, near Youngstown, Ohio. GM, who owns Chevy, is shutting down the plant as it moves away from the manufacture of cars and focuses on trucks and SUVs. 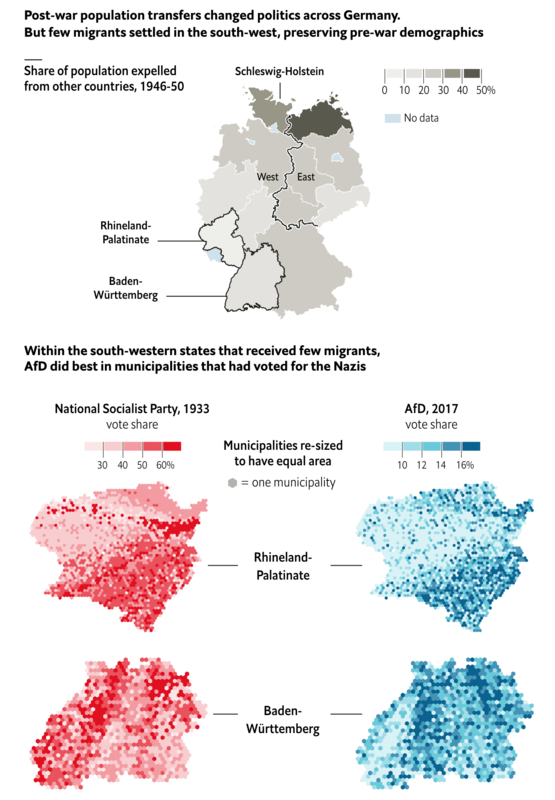 The story is about the people, but it did have this nice little map. It does a nice job of showing that while manufacturing has, in fact, rebounded since the Great Recession in 2009, that rebound has been uneven. 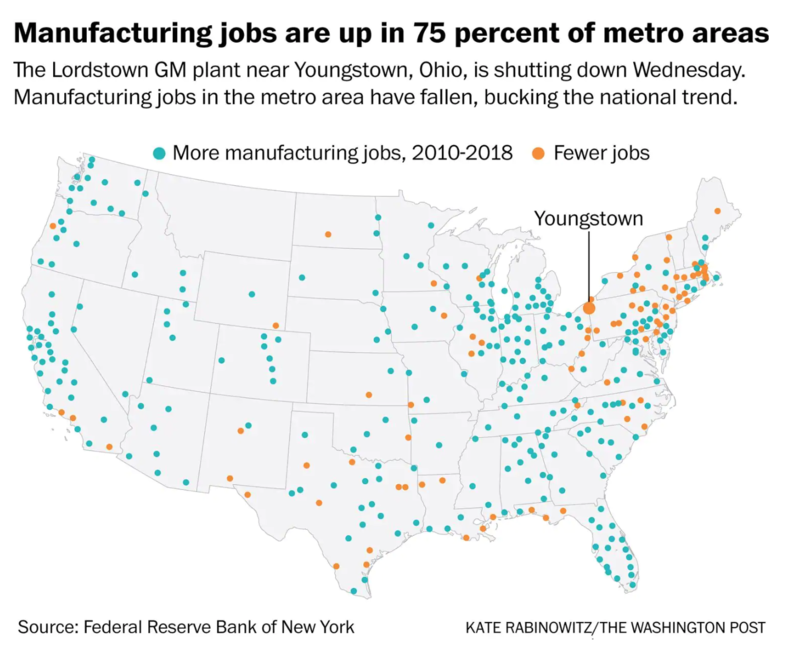 There are some areas of the country, like Youngstown, that have seen manufacturing continue to disappear. Credit for the piece goes to Kate Rabinowitz. Is Bryce Harper Another Ryan Howard? No. Definitely not. 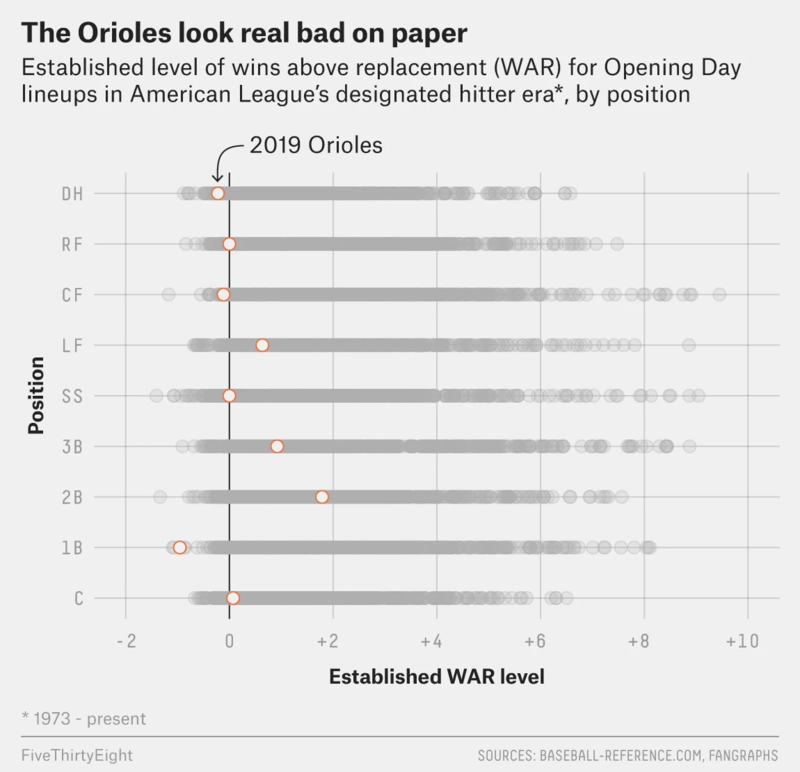 But, the position of this article by FiveThirtyEight is that the Phillies, the Philadelphia baseball team that just made the largest guaranteed contract in North American sports, may have purchased the rights to somebody who is a few years past his prime. The author tracked the performance of similar baseball players over history and found that they peaked earlier and tailed off earlier. Now, the obvious thing about this graphic that I dislike is the spaghetti-fication of the lines. What does help alleviate it, however, are the greying and lighter weight of the non-identified lines in the background. Interestingly, they are even lighter than the axes’ value lines. There is also a thin outline to the lines that helps them standout against each other. I also wonder if a few more added benchmark lines would be useful. 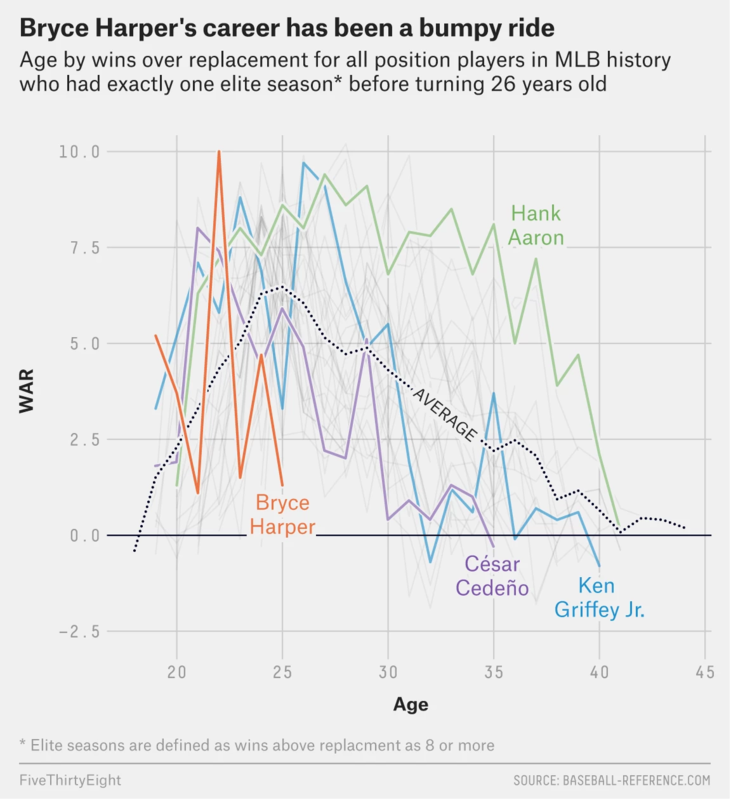 Elite seasons are defined as those with 8+ wins above replacement (WAR), an advanced measurement statistic. 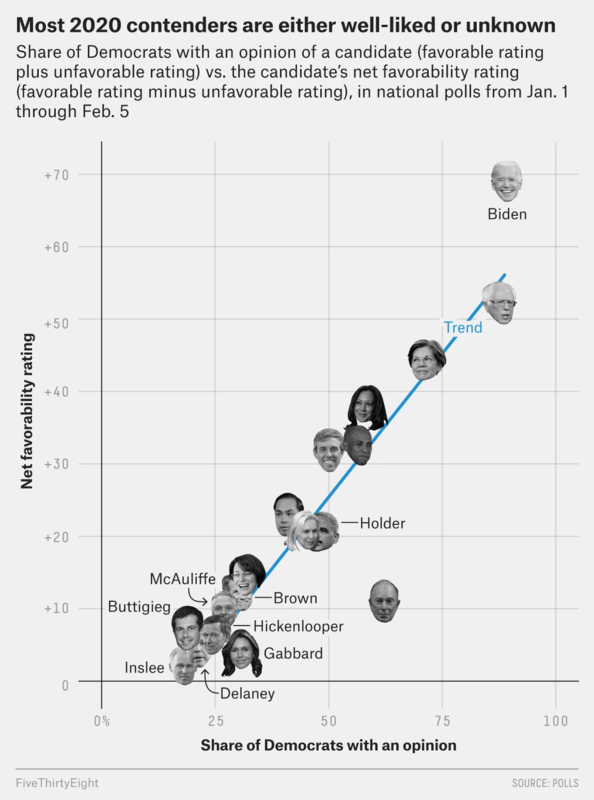 Could that level not be indicated with a line on the y-axis? What about the age of 26, before which the players would have had to produce one and only one 8+ WAR season to be eligible for the data set? Of course, as I said at the beginning, the answer to this post’s title is no. Harper will make the Phillies a better team and the length of his contract will not be the albatross that was Ryan Howard’s. However, the Phillies may be paying for 13 years of subprime Harper. Author Brendan BarryPosted on 5 March 19 5 March 19 Categories InfographicTags baseball, Bryce Harper, critique, data visualisation, FiveThirtyEight, infographic, information design, line chart, sportsLeave a comment on Is Bryce Harper Another Ryan Howard?